There might be nothing in DFW that gets us as fired up as traffic: The slow drivers, the fast drivers, the endless construction cones, the bumper-to-bumper backups on I-35 and LBJ and the Tollway. So when we asked our Facebook followers what the MOST annoying habit of DFW drivers was, we got more than 1,000 replies. In fact, they lit our comments on fire, hurtling into a state of full-on rage. We kind of felt like the Sith Lord in that Star Wars meme. "Good, good...let the hate flow through you." To be fair, it wasn't just a cesspool of vitriol. It was more like a vent session for sane and reasonable drivers while everyone else stayed home. QUIZ: Can you pass a practice Texas driver's education test? Now that we've had a chance to sort through all the complaints and comments, we've whittled them down to a top 10. We'll try to reveal one each day, counting down to the top spot. No. 10: Not doing the zipper! I thought this might be a combination of complaints: Drivers who employ the "zipper" merging technique, and those who don't, with both sides thinking the others deserve to get their license revoked. I was only half wrong. Nearly every mention of the infamous zipper method were complaints about other drivers NOT using it. If you're not familiar with the terminology, the zipper method mostly applies to when two lanes of traffic become one, usually if there's construction or a wreck ahead. To "zipper" means to drive as far as you can in the lane that's ending before merging. You've probably seen this a hundred times. You spot the "left lane ends in 500 feet" construction sign on I-30 in Arlington, so you flip your blinker and merge right like a fine upstanding citizen. But our Facebook commenters are here to say that you...are...WRONG. Don't switch lanes like a pushover. Punch it full throttle across that open pavement and dip into the next lane at the last minute. 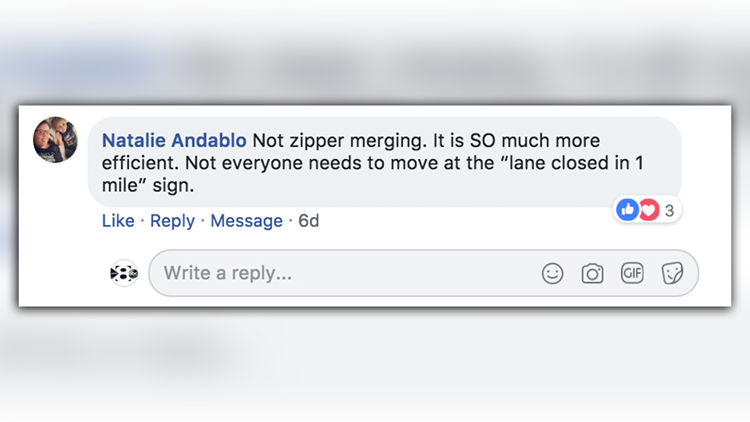 One of several comments on our Facebook page from a suppoer of the zipper merge. But actually, they're kind of right, and they've only got the State of Texas to back them up. The Texas Department of Transportation has introduced the zipper merge along I-35 and other highways as a way to "save time, increase safety and lessen road rage." Merging into the open lane too soon, as courteous as it might seem, "creates a long backup...and leaves the other lane empty," according to TxDot. Other state agencies across the country also recommend the zipper. The Minnesota Department of Transportation produced this instructional video back in 2011, showing how – and why – it works. Resist the urge to merge early!